A volume in Educational Leadership for Social Justice Series Editor Jeffrey S. Brooks, University of Missouri-Columbia, Denise E. Armstrong, Brock University; Ira Bogotch, Florida Atlantic University; Sandra Harris, Lamar University; Whitney H. Sherman, Virginia Commonwealth University; George Theoharis, Syracuse University The Emperor Has No Clothes: Teaching About Race and Racism to People Who Don't Want to Know offers theoretical grounding and practical approaches for leaders and teachers interested in effectively addressing racism and other oppressive constructs. 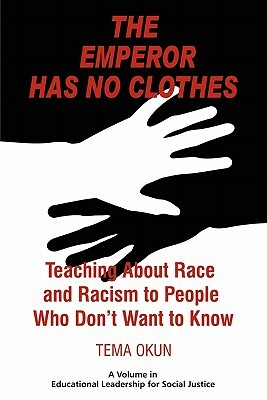 The book draws both on the author's extensive experience teaching about race and racism in classroom and community settings and from the theory and practice of a wide range of educators, activists, and researchers committed to social justice. The first chapter looks at the toxic consequences of our western cultural insistence on profit, binary thinking, and individualism to establish the theoretical framework for teaching about race and racism. Chapter two investigates privileged resistance, offering a psycho/social history of denial, particularly as a product of racist culture. Chapter three reviews the research on the construction and reconstruction of dominant culture both historically and now in order to establish sound strategic approaches that educators, teachers, facilitators, and activists can take as we work together to move from a culture of profit and fear to one of shared hope and love. Chapter four lays out the stages of a process that supports teaching about racist, white supremacy culture, explaining how students can be taken through an iterative process of relationshipbuilding, analysis, planning, action, and reflection. The final chapter borrows from the brilliant, brave, and incisive writer Dorothy Allison to discuss the things the author knows for sure about how to teach people to see that which we have been conditioned to fear knowing. The chapter concludes with how to encourage and support collective and collaborative action as a critical goal of the process.